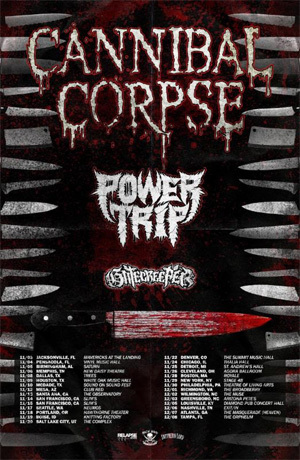 This November, CANNIBAL CORPSE will kick off a USA tour, in support of their upcoming, untitled full-length, due out this fall. The trek also features POWER TRIP and GATECREEPER, making this one show not to be missed! See below for all dates. CANNIBAL CORPSE released their 13th studio album, A Skeletal Domain, in 2014 via Metal Blade Records and debuted at #32 on Billboard's Top 200 chart (the highest chart position in their storied career!). The band's new album - which was recorded at MANA Recording Studios with producer/engineer Erik Rutan (SOILENT GREEN, BELPHEGOR, HATE ETERNAL) - promises to be another aggressive, powerful record in their catalog, that will surely make history once again.